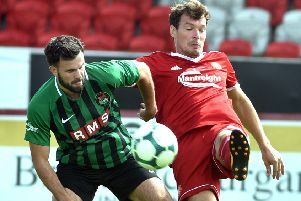 St Mary’s produced a five-star performance despite six selection changes to the starting line-up against Lurgan Town. The Saints entered the half-time interval with a commanding 4-1 lead in the Bob Radcliffe Cup. Conor Hagan - the St Mary’s player\manager - joined play after the break to help protect the lead, with a fifth and final goal adding to the hosts’ knockout gap. Joe McKeever lined out between the posts as the first of the changes made by Hagan to enhance playing time across the squad. Paul O’Hara, Neil McKee, Sean Brady, Chris Fay and Gerard Kerr also featured from the first whistle. Ruairi Feeney added to his strong scoring sequence with a cup hat-trick. Marc Davidson finished with a brace of goals. Davidson kicked off the scoring with a measured header before Lurgan Town managed to level the tie. Feeney’s long-range drive into the top corner helped to restore the St Mary’s lead. Feeney added to his tally by racing clear of the Lurgan Town backline and slipping a shot past the away goalkeeper. Davidson closed out the first-half scoring and Feeney’s hat-trick finish served to complete the treble. Lurgan Town suffered a red card with the scoreline at 4-1 following a foul outside the penalty area by the goalkeeper. SEPTEMBER 15: Hanover, Tandragee Rovers, Castlecaulfield, Portadown BBOB reserves. SEPTEMBER 12: Portadown BBOB, Orchard Athletic. SEPTEMBER 19: Donaghmore, Armagh Rovers, Southside reserves. SEPTEMBER 26: Coalisland Athletic, Southside.